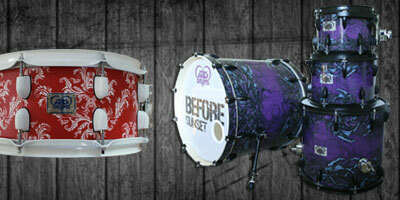 double bass drum kit but to make it easier we have tried to group a few ideas together to help your creativity flow. This is where all styles and configurations tend to sit, if you want lime green sparkle with pink hardware it's all possible. Let us know your ideas and we will work with you to ensure the kit we deliver a kit that goes beyond your wildest expectation. 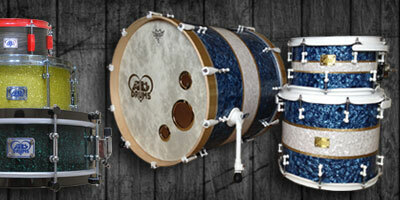 A more classic style kit with the use of wooden claw style hoops. Pearls and Wooden veneers tend to work very well on these style kits, We aim to include as many small ideas to tie in the look completely (e.g. like colour matching the inside of the claw hoop with the exterior shell finish). 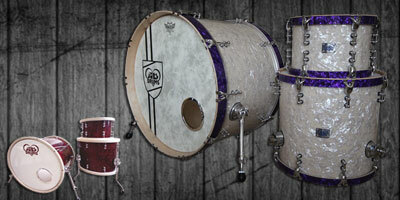 This is the funky name we have given to our custom printed kits and snares. A full in-house design service is on hand to create these one off pieces so unique no other person in the world could ever have the same design. We print and manufacture all our custom wraps in house which ables us to have complete control over the final outcome. 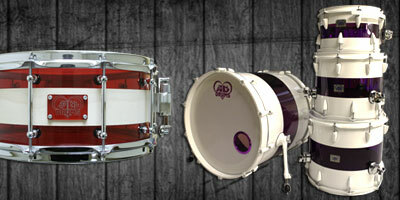 The acrylics in our hybrid drums and acrylic drums is available in many different colours. We offer some very unique ways in customising the acrylic shells including paint/sand blasting/wraps/veneers and decals. Our LED lighting system can also be added to any of our acrylics or hybrid drums.Various finishes can be applied to the wooden areas of the hybrid drums too for extra detailing.